Raechel and Jacqueline Houck died driving a rental car that had been recalled for a power steering hose defect but had not been repaired. 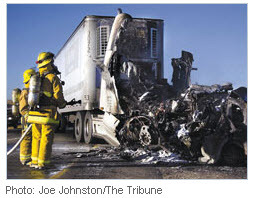 The car caught fire because of the defect while traveling on the highway, causing a loss of steering and a head-on collision with a semi-trailer truck. To make sure this tragedy is not repeated, U.S. Senators Charles E. Schumer (D-NY), Lisa Murkowski (R-AK), Barbara Boxer (D-CA), and Claire McCaskill (D-MO) have introduced a bill that would ban rental car companies from renting cars that have been recalled by manufacturers. The bill is named in memory of the two sisters who tragically died in a rental car that had been recalled by the manufacturer but wasn’t repaired by the rental car company (see picture). Hearing in the Senate is planned for May 21st.